A Critical System Team Reserve may be used to fix, maintain, or replace any element of the system to keep it operational. The money is not available to upgrade the system. That requires some other spending authorization. The Tennis Court and the Hot Tub are considered luxury items. As such, their Reserve Caps are only intended to cover half of the estimated costs. The other half is to come from private donations. - remove "data lines" and add "common infrastructure for internet and other telecommunications"
- remove words "kid's" and "play" from "concrete slab by workshop"
- remove "maintain and set thermostats in Common House"
- remove "provide information for community-built homes with microprocessor-controlled furnaces"
- add "snow removal from pathways and roads"
- add "drainage ditches in the cluster and outside the cluster"
- change from "3 to 6" to "6 to 8"
- Increase the number of members from "3 to 5" to "4 to 6"
- Revise the first paragraph to reduce the number of Nominating Task Force members to "at least 2," change the deadline for posting the slate to "the last day of February," and change references to number of nominated members from "3 to 5" to "4 to 6." Create a new Community Meals Agreement. See below. The Community Meals Manager, the Common House team, and Mac are to revise the Common Meals Guideline to reflect this proposal and to capture best practices shared in the recent Community Meetings. Additionally, because eating together so greatly strengthens our community fabric, members are strongly encouraged to participate in community meals. See our Community Meals agreement for more information. The Membership team is to revise any applicable Membership guidelines to reflect the new Community Meals Agreement -- i.e., members are strongly encouraged to attend community meals because eating together greatly strengthens our community fabric and it’s one of the best ways for new members to integrate into the community. Common Meal work participation is separate from the Community Work and Participation System. Work done in one system does not count toward the other. For more information about Common Meal work participation, please see the Community Meals Agreement and the Community Meals Guideline. Each time the Steering team creates a new conceptual plan for the Community Work and Participation System, that conceptual plan must be approved by the community. Minor tweaking of an existing plan does not need to be approved. Regular feedback (at least annually) is encouraged for the Community Work and Participation System. Community meals are a core part of what makes Heartwood such a strong community. When we cook, clean, and eat together, we strengthen our community fabric. We get to know each other better and care more deeply for each other. Those deep connections allow us to more gracefully navigate the periodic interpersonal conflicts when they invariably arise. We have found that participating in community meals leads to greater participation in other aspects of community life. When more members engage more deeply in community life, we have a stronger community. We have two main types of community meals: common meals and potlucks. Common meals are regularly scheduled at least twice per week. The Common House team may also schedule additional common meals. Cooks sign up ahead of time, decide on and post the menu, grocery shop, and prepare the meal. A clean up crew also signs up ahead of time. Members sign up ahead of time if they will be eating the common meal. They get charged for common meals with the proceeds going to reimburse the cooks for groceries and pay for staples. At Heartwood we cook and clean up for each other and eat together on a regular basis. All members are strongly encouraged to participate in common meals unless there are overriding circumstances in their lives which keep them from doing so. Examples might include special diets, health issues, scheduling conflicts, etc. (Note that cooks go to great lengths to accommodate most special diets.) Anyone eating more than one common meal per month must participate in common meal cooking and/or clean up. Potlucks generally happen on Friday evenings. Everyone brings a dish to share and helps clean up. When a member chooses not to participate in common meals (not including potlucks), they let the Community Meals Manager know in advance so the Community Meals Manager can plan accordingly. This is very important so the Community Meals Manager knows how many cooking and cleaning slots to make available. If a member does not participate in the common meals, the Common House team will follow up with them to learn the reason for the current non-participation and/or to encourage future participation. The point of the follow up is inquiry and encouragement. It is not a policing role, but rather a role of loving collaboration. Waive the requirement in our Membership Agreement for Tim Delaney or Kathy Rusconi (dba Delconi LLC) to become Heartwood members. Gail will continue to assume full homeowner responsibilities for #15, except for financial obligations to the HOA. Tim and Kathy will remain ultimately responsible for all financial obligations to the HOA related to #15. When Gail no longer lives at #15, Tim and Kathy will cooperate with the community and follow our Membership Agreements in selling the home. If they decide to continue to own the home instead of selling it, they will become members at that time. Overall responsibility for the wise stewardship of our irrigated pasture land. The primary stewardship priorities are long term environmental health, agricultural production, food production, livestock use and aesthetics. The current wet lands, oak groves and drainages will be respected and stewarded primarily for wildlife. a. A team decision that is expected to have a permanent impact (e.g., building a structure, semi-permanent changes to the land) must be shared with the community prior to initiation, with time for comments and community member involvement in the decision. b. Community members who are not on a team may be part of the consensus process of that team for a specific decision of special interest to them, as long as they participate fully in the decision-making process. 2. Revise the Pasture & Agriculture section of the Teams Agreement (in particular the subsection titled Specific Responsibilities and Authorities) to clarify that SPAT and NPAT have full authority for creation and management of barns and outbuildings, which is still governed by the new requirement for all teams who plan to build a permanent structure to communicate this intention with the community, with time for feedback and other community member involvement. The proposed changes are reflected in red below. All members are expected to be a member of, or contribute to, at least one Heartwood team or task force. Except for the Steering Team, which is ‘elected’ by consensus decision each year, members may choose which team or task force to participate in. Members may choose when to join, leave, or switch teams. The number of members listed for each team, except the Steering Team, is only a guideline. Any community member may participate on a team or task force to work on an issue of special interest to them. Community members may be part of the consensus process for a team they are not normally on, as long as they participate in the entire decision-making process, including working through red cards following our Decision Making and Meetings Agreement. The land below the irrigation ditch is covered under this agreement. Two teams are responsible for overseeing the health of our pastures and our agricultural efforts: the South Pasture and Ag Team (SPAT) and the North Pasture and Ag Team (NPAT). Each team is wholly responsible for the land, irrigation system, and fencing on their portion of property. The N-PAT manages the land south of the irrigation ditch to the fence which runs from Koenig’s NE corner east to Heartwood Lane. This includes the fenced-in area previously known as the Community Garden. It does not include the cluster irrigation pond, pump house, and the area around the pond, all of which are managed by the Land Stewardship Team (LST). It also excludes the land managed by SPAT. The NPAT manages the west head- gate. The S-PAT manages the land south of fence running east from Koenig’s NE corner to HW Lane, the east pasture, the triangle by Rivers’ driveway, and the spring fed pond. This does not include the turn around near the entry on Heartwood Lane (LST) or land managed by NPAT. The SPAT manages the east headgate. In addition, the SPAT is primarily responsible for overall management of the Tractor and it’s associated implements, and of our ditch/water rights. The two teams are similar in many ways, as indicated below. The ways in which they are different are found in each team’s unique Long Term Land Use Plan, their Short Term Land Use Guidelines, and the contracts that each team makes with the private entities using their portion of the irrigated ag land. To guide the community in its use of and interaction with our irrigated pasture land. To achieve this, we will explore, learn, and implement the principles of holistic management in a manner that sustains a healthy, beautiful, and diverse ecosystem for wild and domestic plants and animals. Arrange shared use of tractor and agricultural implements in a cooperative manner among SPAT, NPAT, and other community and individual uses. -- Full Authority. Consistent with the Operating section of the Budget spreadsheet dated 11/22/16 (above), the total 2017 Operating Uses budget will be $53,444. 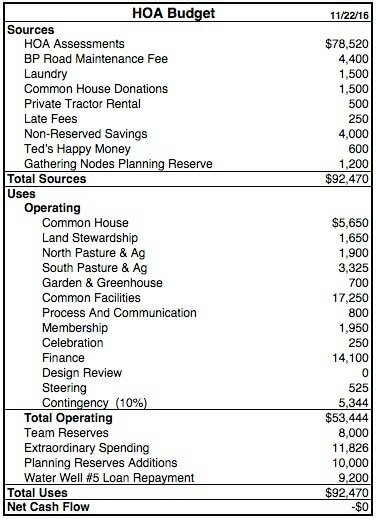 Specific team Operating budgets are detailed in the spreadsheet. Teams are authorized to spend their Operating budgets as they decide consistent with their responsibilities listed in our Teams agreement. C2 Spending authorization is effective immediately and ends on December 31, 2017, unless otherwise noted. C4 South Pasture team is authorized to build as much wooden fence along CR 506 as the budget will allow and to place it as they see fit. They have available $8426 from the HOA plus any additional funds received from private donations and also from our neighbors, the Martin’s, for shared fence cost sharing. C5 Spending authorization for LST - Rebuild SS Ponderosa and LST - Replace Village Green Pathway ends on December 31, 2018. The CFT - Potable Water Supply Upgrade Planning Reserve will receive annual funding of $3000 beginning when the Water Well #5 Loan is fully repaid. Annual funding of $3000 will continue until the balance of that Planning Reserve reaches $100,000. Finance team is authorized to hire Fran as our new bookkeeper. The reserve of $600 for Ted’s Happy Money will be retired. The money will be used to fund the 2017 HOA budget. The Planning Reserve of $1200 for Gathering Nodes will be retired. The money will be used to fund the 2017 HOA budget. $4000 of Non-Reserved Savings will be used to fund the 2017 HOA budget.